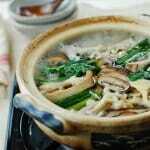 Learn how to make Korean vegetable broth for your Korean soups and stews! It’s super easy to make and requires very few ingredients. 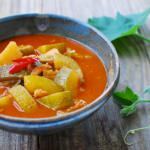 In my previous post, 15 Korean Vegan Recipes, I mentioned that many classic Korean dishes can easily be veganized. You can make the dishes like bibimbap or japchae vegan simply by omitting the meat and the egg. 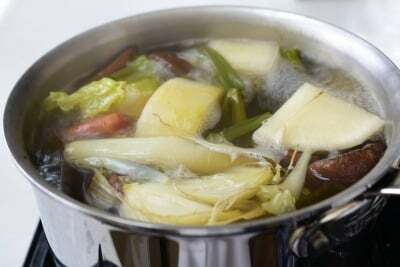 For soups and stews, you will need to substitute the meat or anchovy broth with vegetable broth. Here’s how to make Korean vegetable broth! Making Korean broth at home is really easy! More so with vegetable broth. It doesn’t take much time and requires very few ingredients. Called chaesu (채수) in Korean, vegetable broth can be made with a variety of ingredients. 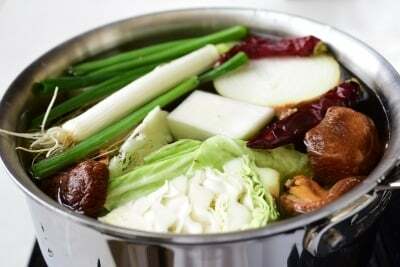 However, there are a few vegetables that are typically used to make Korean broth. They are dried dashima (다시마, aka kombu), dried shiitake mushrooms (pyeo-go beoseot, 표고버섯), Korean radish (mu, 무), large scallions (daepa, 대파), and onion. For rich, flavorful vegetable broth, dried dashima and dried shiitake mushrooms are the two most important ingredients. They are good sources of glutamic acid, an amino acid responsible for savory taste and full of nutrients. 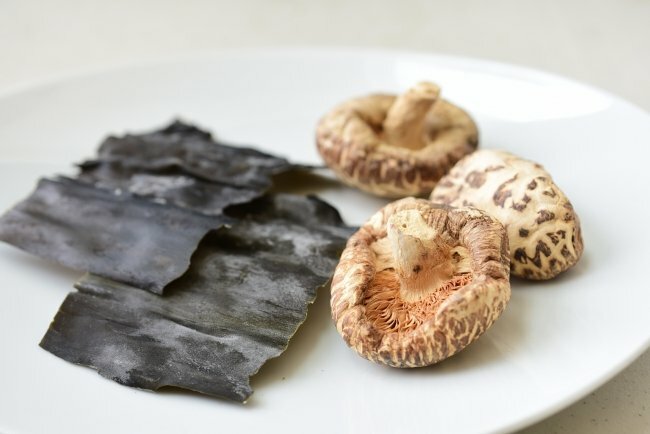 If you make Korean food often, dried dashima and shiitake are must-haves in your pantry! 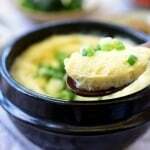 Korean radish lends a refreshing taste to the broth, and scallions and onion add natural sweetness. You can also use vegetable scraps, such as cabbage cores, mushroom stems, onion peels, carrot peels, etc. 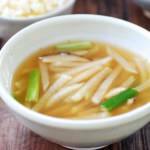 In this recipe, I used several of the classic Korean broth ingredients. Sometimes, I only use dashima, and other times I also use shiitake mushrooms and more. It’s that versatile! Also, the amounts of vegetables in this recipe are only guidelines. You can certainly use more or less. 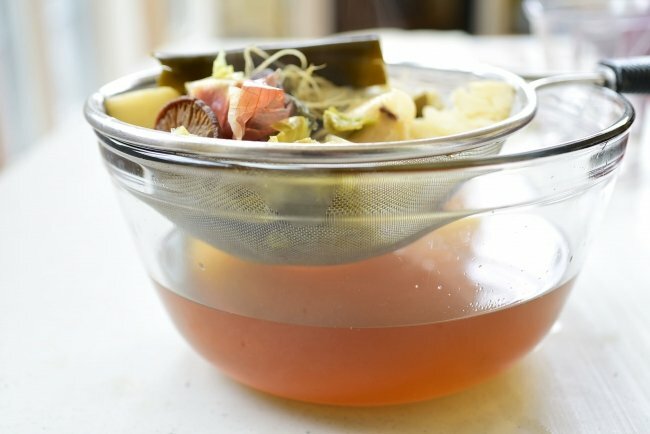 The simplest vegetable broth in Korean cooking is dashima broth. All it takes is a few minutes of boiling dashima pieces. 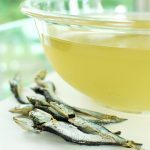 To maximize the flavor, pre-soak the dashima for 30 minutes or longer before boiling it. The white powder on the surface is the natural flavor enhancer, so don’t wash it off. Another option is to use dried shiitake mushrooms along with dashima. The resulting broth is quite rich and flavorful! This broth is very common in Korean temple cooking. Shiitake mushrooms are full of earthy, savory flavors, which intensify when dried. The liquid from reconstituting dried shiitake mushrooms is good broth by itself. 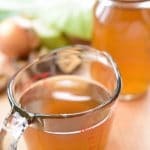 Save the liquid to use in a sauce, soup or stew. Sometimes, I throw in some onion to round up the earthy, savory flavors of the broth with natural sweetness of the onion. Finally, for more depth and complexity, use Korean radish, large scallions, dried chili pepper flakes and/or vegetable scraps, such as cabbage cores, mushroom stems, onion peels, carrot peels, etc. I used this batch to make vegan doenjang jjigae and baechu doenjang guk. They were delicious! This can be a base for many other Korean recipes, in place of the meat or anchovy broth, such as manduguk, tteokguk, kongnamul guk, mu guk, kimchi jjigae, soondubu jjigae, jjambbong, gyeranjjim, and janchi guksu. 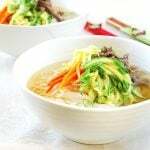 Have you tried this Korean vegetable broth recipe? Please rate the recipe below by either clicking the stars in the recipe card or in the comment section! And make sure to share your creations by tagging me on Instagram! 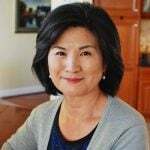 Stay in touch by following me on Pinterest, Twitter, Facebook, and Instagram. 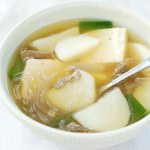 Learn how to make Korean vegetable broth for your Korean soups and stews! It's super easy to make and requires very few ingredients. 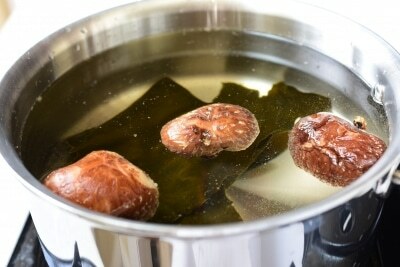 Soak the dashima and shiitake mushrooms for about 30 minutes in a large pot with 10 cups of water. 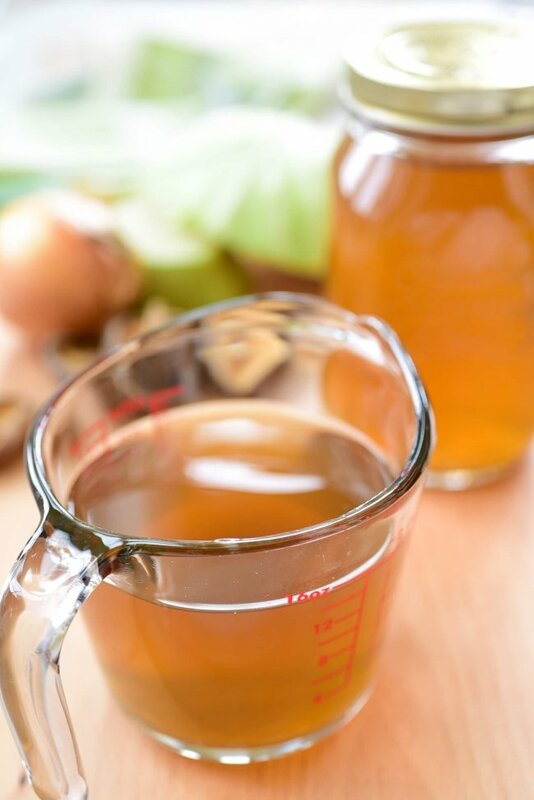 You can skip soaking if you don’t have time, but soaking maximizes the flavor of the broth. Add the other vegetables you're using to the pot. Bring it to a boil over high heat and boil, covered, for 10 minutes. Remove the dashima. Reduce the heat to medium, and continue to boil, for about 20 minutes. Turn the heat off. Let the broth cool. Pour the broth through a strainer into a large bowl. Press the vegetables with a spoon or spatula to squeeze out any remaining broth. Store the broth in the fridge up to a week, or in the freezer up to 2 months. Close to dashi. Missing katsuobushi.